Have an aquarium in the office, at home, or half way across the United States? With Reefware you can now keep track, monitor, and adjust your maintenance schedule all in one place for multiple tanks. 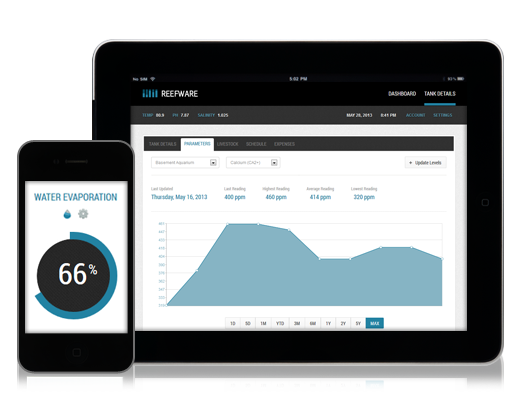 Reefware provides a user friendly interface to display your water evaporation, media replacement, and maintenance schedule so your tank can stay healthy and beautiful. Create profiles for each of your fish, corals, and inverts. Keep track of how they behave, what they eat, and who they are compatible with. Being observent and having a successful tracking program can help your fish have a long and healthy life. With Reefware you can manually track your aquarium levels or use some of the industries top aquarium controllers including Digital Aquatics, Reef Angel, or Neptune Systems.